Here is a list of things my missionary son, Elder, wished he new about clothing before he went on his mission. (He wrote it after I requested help for his cousin who was preparing to serve.) He also surveyed other Elders in his Zone (area) who added to the list. Hopefully, it will be of some help to others'. 4) Shirts: The NO-iron shirts. More short-sleeve than long-sleeve. probably 8-10 short, and 2-4 long (depending on mission policy on suits) but in our mission we can't roll up long sleeves, so short would have been much nicer. - Extendable-collar shirts would have been nice. Walmart 'George' brand makes them. You don't get choked when the collar is a little bit too tight. 5) Under garments: wider variety - I only brought 1 type, and they're not good to workout in. 7) Pants: Washable suit-pants. I bought my new suits from Tuxedo Warehouse, and they are pretty nice. They are more on the fragile side, so that is something to watch out for. (his cousin got all his at Mr Mac and they have a great package price with shirts, ties, shoes and washable pants included -- each package was 495.00 for suit with 2 pants, 4 shirts, 4-5 ties, 2 shoes). He had to buy two packages plus an overcoat (layered dress coat) which was about $170.00. *Plan on spending about $1,500.00 at Mr Mac plus $100.00 for their men's shoulder bag which is specifically recommended for missionaries. That's about all I can think of right now. 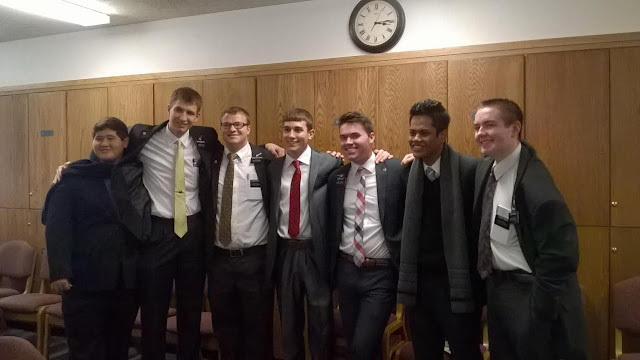 I emailed a bunch of missionaries, and some of these are the responses I got. I hope it helps! I hope this is okay to share. Elders? You okay to show other missionaries some good ideas? Thanks!